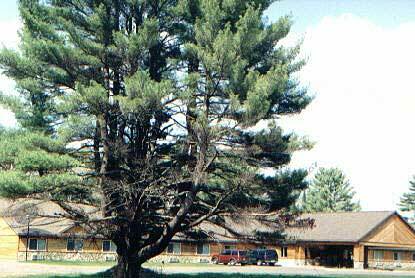 Outdoor Photo of White Pines Lodge. Photo by Gwenevere Young. Copyright 2000. Ten minutes from the North Star Casino and one mile south of the golf course you will find a wonderful lodge that invites you to bring the whole family, yes bring your children! The White Pines Lodge offers fun family activities, the large Sport Court can be reserved for free to play tennis, basketball and volley ball. Even the needed equipment is available. The game room is a great place for the children as well as the swimming beach just steps away. Baby sitting services are available through the owners and hosts. 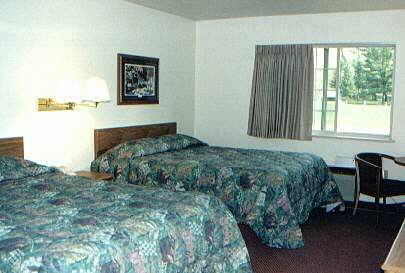 Each of the 28 rooms has a refrigerator and microwave. Four of the rooms are suites with a free standing jacuzzi. All guests have access to the nine person whirl pool. A continental breakfast is included and generous casino packages are available. The building itself was built in 1999 and sits on Island Lake in a wooded setting. Island Lake is a non-motorized 40 acre lake. A beautiful place to enjoy the sunsets. The White Pines Lodge has a casual dinning restaurant and full service cocktail lounge, The Thirsty Whale. Great food along with better than average prices, which over looks the lake. The owners are also the hosts, making the lodge a very personable place to hang your hat on vacation. I can't imagine a better choice in the area for families and romantic getaways.